can apply online for this MAHACID vacancies of Police Sub Inspector and Document Examiner jobs from 15-11-2017 to 14-12-2017 via the official website of www.maharecruitment.mahaonline.gov.in or through www.mahacid.com . Candidates will be selected based written test and physical tests. Complete details will be available from 15-11-2017 via the Maharashtra recruitment website. 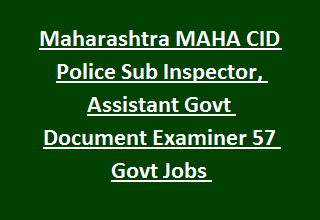 There are total 57 vacancies in this Maharashtra CID Police SI and Document Examiner Jobs. Complete details about his MAHACID vacancies of Police SI and Examiner is given below. There are total 57 posts in this Maharashtra Criminal Investigation Department recruitment of Police Sub Inspector and Document Examiner Jobs. For Police Sub Inspector of CID Jobs candidate must have qualified Degree from any recognized university and computer knowledge certificate. For Assistant Govt Document Examiner Degree with Computer Knowledge skills along with type writing is required. Candidates must have the above 18 years old and upper age limit is applicable as per Maharashtra State govt norms. Candidates will be selected based on physical tests, written test and interview. Refer official notification for exam pattern, syllabus and physical test details. Online applications only accepted for these Mahacid vacancies of Sub Inspector and Asst Govt Document Examiner jobs. Online application link will be active from 15-11-2017 @www.maharecruitment.mahaonline.gov.in. Last date for submission of application form online is 14-12-2017.